What makes a toy super fun for a child? This is something that many of us have been asking for years. Each year, hundreds of new toys emerge onto the market and every year, children have that one toy they just can’t wait to pull into their lair and play with. This year, the 2017 Toy Fair was held in New York and we’re telling you right now, if you didn’t get a chance to see it, you missed out on a lot of amazing toys. Today, one that popped up in our minds when we woke up was the StikBot Stop Motion Pirate Movie Set. Perhaps we thought of this toy because we like pirates? Who knows, either way, we decided it would be a good idea to introduce our readers to it. If you have never heard of StikBots before, you’re probably a bit confused as to what they are and we must admit, the name sounds a bit funny. For starters, Stikbots are really cool toys. If they weren’t so cool, we wouldn’t be here telling you about them right now. Basically, you can use StikBots to film stop-motion videos that you can post on YouTube. If you go over to YouTube right now and type in “Stick Bot movies,” you’ll come across a lot of StikBot stop-motion videos – it appears that children across the net have discovered StikBots. However, at the time of writing this review, you’re probably not going to come across children posting videos of the StikBot Stop Motion Pirate movie set, because this set isn’t available to the general public right now (this set will come out later this year). If you have an Android or iOS device, you can pose the bendy little Stikbot actors and create a stop-motion video that you can share with all of your friends. An adult will need to download the free mobile app that is available. With the StikBots, both children and adults alike can have a lot of fun with creating stop-motion movies (yes, you will also find adults posting stop-motion videos on YouTube). Stikbots are posable – you can make them pose differently, depending on the movie you would like to shoot. Basically, you can shape them however you need. These guys have a face (some of the StikBots have faces that erase, which is a con, but this can easily be fixed by taking a sharpie and drawing your own face on there). They have little suction cups that are responsible for helping them stand up, so once you get the StikBot in place, you don’t have to worry about it falling over as long as the suction cups are working properly for you. 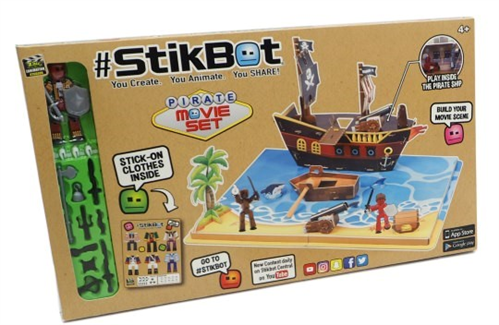 With the Stikbot Stop Motion Pirate movie set, you can basically create any pirate setting you can stew up in your mind – fight your way through the ship, fencing as you walk or go wherever your imagination takes you. All in all, from what we witnessed, the StikBot Stop Motion Pirate Movie set is going to be a big hit amongst those that have a love for pirates. Just imagine all of the exciting stop-motion movies you will be able to create with this set.